Today my Facebook newsfeed was filled with “First Day of School” pictures and I loved it. With brand new shoes, a snazzy new outfit, and a bookbag filled with shiny new school supplies, these tiny tykes were ready to take on the world, or at least a new classroom. While so many of my friends were shedding a few tears at the bus stop and encouraging their little ones to hold up their “First Day of Kindergarten” signs a little higher, other friends were looking quite cheerful at the thought of their older kids filling their days with school books. But not me. Today I got a short reprieve. At 9:00 in the morning the kids and I were still sitting in our PJs watching TV, but I had that pressure building in my chest of impending sadness. While I’ve dodged the kindergarten bullet this year because of my boy being a summer baby, there are still big changes around here. In one week, my five-year-old will be in school five days and my three-year-old will be at school two days. And while I’m so excited for them to explore, learn, create, and play at their new school, I am also a weepy mess at the thought of them being away from me. I don’t do well with change, and this is a big change. It’s also the start of a new normal. 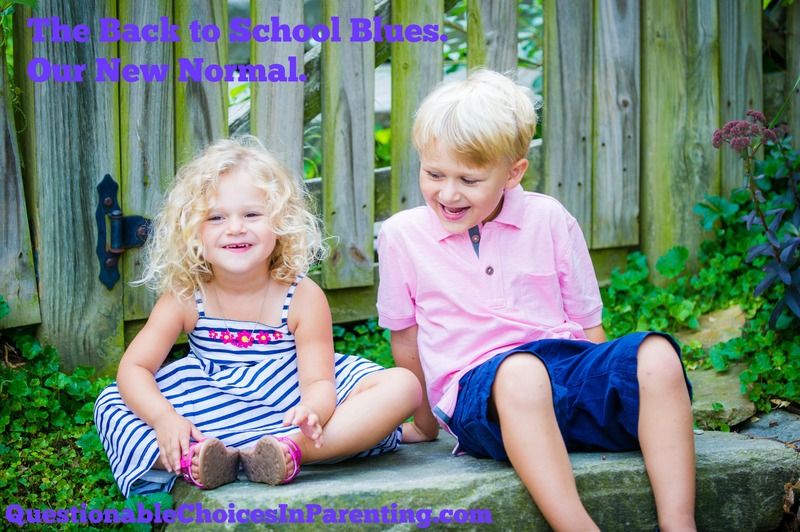 Rather than filling our days with playgrounds, adventures in the backyard, and maybe too many hours in front of the TV, we’ll be on school schedules. We’ll take vacations when school is out. We will set our clocks to school time. And I will miss them when they are gone. I will MISS them every day. Of course I’ll love the small chunks of free time and it will become the new way we function, but I will truly miss this part of our life, when it was just the three of us all day. And that is so terrifying to me. Since I signed on as a stay-at-home-mom, acting as cruise director every day has been my task. Now that’s all changing. I have this sense of dread that’s gnawing away that I haven’t done enough for them. Enough to prepare them. Crazy, I know. These two are headed to preschool and not a cross-country journey; however, it’s all relative and I’m really struggling here. Have I read to them enough? Does that little one even know her letters? Will they remember to wash their hands? What if someone is mean to them? Dear Lord, I CANNOT handle someone being mean to them. How early can I hope for a snow day? What is it about school that brings about these irrational fears in mothers? It’s as if our deepest darkest fears will be recognized when we send our kids off to school because someone will realize we haven’t been doing our job and we’ve really just screwed up our kids. Am I crazy? YES! I know my kids will be fine. They love school, they love making new friends, and they are so smart, but dang, the guilt and fear is weighing me down. Yes they will be fine. But will I? Maybe I just need to get through the first day or the first week before I can breathe a bit. I have an entire year before I have to put my son on a bus for kindergarten and few years before my gal follows behind. I know when they step on that bus for the first time, they will be golden and so ready for the big world of elementary school. Me, not so much. But for now I have a little more time. A little reprieve before our new normal. My kids start back tomorrow and I have mixed feelings about it. We had a short summer this year because of a ton of snow days last year, so I am a little sad to see them go. My kids go back in one week! I’m excited for them to start a new chapter in their lives. Plus, I will get a much needed break. Mine start today and I really need that break!!! Such a bittersweet time. But I’m sure you’ll settle into the new normal soon. In the meantime, enjoy your last week with both kids at home! I hear ya, sister. I’m always like, “No teacher will ever love my babies like I love them!” And then my rational husband reminds me it’s not the teachers’ job to love our kids. Ooopsie. We’re in for it next year, eh? “New Normal” begins September 2015. Yoi. Mine are both back to school and yes, I do miss them like crazy. But I’m also loving how much I’m getting done around the house and with work! Memories of my excitement over going to kindergarten are paled by the memory of my mom leaving me at the door while she headed to another school and her teaching job. She was crying and I did not understand why. It was my moment to become an adult, even though I was just 5. Cherish those kids this year and bring tissue when you walk your son to the bus next year. I have those same irrational fears. I’m nervous and my son is excited. He’s about to go to big boy school and my brain is in overdrive about it all. The blues, indeed. Back to school can be an exciting change, but I understand about being nervous. Hang in there, pretty sure school time will be the new normal. My son started Pre-K Monday through Friday last week and I was a bit nervous at first. He’s always just been with me or my mom while I work but he LOVES it! I am so proud of him and this next chapter in both of our lives! I’ve got a few years before school for my little man too. Though this time of year inspires me to get my act together though! I know what you mean. I always feel a little broken hearted when school starts back too. It is such a huge change when they go to school. They will have so much fun. I totally understand what you mean. The same thought makes me teary, too! i’ve been home for 9 years and 2 months. me. all day, every day. i’m also the cruise director. tomorrow my littlest will get on a school bus and go to all day kindergarten. and i’m tearing up as i read this. i’m so excited for her- and yes, excited for me time. but i’m also beyond heartbroken that my baby is this old, and i won’t have another preschooler, a partner in crime, a sidekick like i’ve had for 9 years. maybe i’ll finally get the house really clean. probably not. but you never know…. It is a big change! My youngest goes to kindergarten next week. Oh that is a tough time when they head back to school. Fortunately you all will be just fine! I wish I had more time with my oldest to be home. He just started kindergarten this week. Mine started back to school yesterday. However mine are older – the youngest is in 5th grade and the oldest is a junior in high school. So I have had a lot of time to adjust 🙂 Trust me it does get easier and you will come to enjoy the quiet time when they are at school. I went through it too. I counted down in my head, now I have 1 year to go until both my kids are in school at the same time. I’m ready, but not ready. Reading your post was perfect for me today. You are not alone. I am so sad today as well. I miss my kids. My three yr old said he didn’t feel well. But I don’t know if he really doesn’t feel well or is it he just wants to stay home with me… I sent him anyway but now I’m regretting it. What if he is really getting sick? Our kids don’t go back until after the long weekend so I took Friday off so it can just be “us” before everything changes. This year, I think will go smoothly but next year when the youngest starts kindergarten will be much harder. My oldest is starting her second year of university so she is still at home. The routines will be nice…busier but nice. One day at a time right! I always feel sad the first week or two, but then I realize that we thrive much better on routine. Best of luck to your kids in their upcoming school days! The first day of school is always hard. I was a mess when my oldest started kindergarten. I still remember my children’s first day of school. Feels like forever ago now. In a few days my son will be at his first day of College! I’m not good with change either so when my daughter starts school, I’m sure I will be teary eyed the first day but the thing is, I know she is going to love it! We have a year to go though! I love the pictures of your kids on their first day of school! Happy back-to-school time girl! Kiddo goes back day after Labor Day. She is really looking forward to it. I am excited for her. We start our new homeschool year the Tuesday after Labor Day. The summer went by fast didn’t it? Your kids are adorable, and I hope they have a great school year! I get where you are coming from. They will do great in school. Back to school time can be exciting and nerve-wracking! They will do great in school. back to school time is always bittersweet but by this late date and my kids are still home they need structure. The feeling is mutual, I am equally nervous as to their preparedness. We don’t head back to school till Sept. 4/5th so savoring the last few days of summer while looking over my growing list of to does. My daughter was home schooled and then we tried a Charter school for 4 years. We liked it but I could not ever breath! I was in her classroom constantly helping out. I was there so much that the school asked me to work there….but even then I did not feel like it was the right place for her. So this year I am home schooling again. I know exactly how you feel.it’s bittersweet but the kids wikl be fine. My daughter loves school and blows my mind how much they learn and grow in school. They look ADORABLE! I feel ya on the back to school blues. Sweet post. You are a wonderful mom. It is so hard to let them go. Kindergarten is even worse!!! There’s just something about that big yellow bus! I don’t worry what people in the school will think of my parenting, phhh to them if they don’t see the kids are so well mannered, smart, and good peeps. I do hate having the kids gone all day though. Hate it!! And that picture you put up is adorable. We go back Tuesday here. I have mixed feelings about it all. I’m SO excited for them to go to school – they’ll love having more peers their age, and a structured environment, and I’ll be loving the peace and quiet in the house so I can get more work done. BUT… that means they’re growing up, and getting further away from the infant stage I loved SO much. You’ve dne enough! Your kids will bloom where they are planted and flourish. I hear you! We all have these thoughts from time to time 😉 I’ve only one child in school, entering fourth grade already! Two still at home, and I am doing my best to cherish each moment. I’m not at all ready to part with them yet.